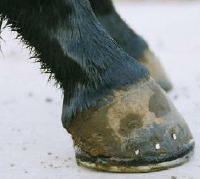 Here is an example of a horse with sidebone on both front feet. The lateral cartilages have ossified into what looks literally like a bone on the sides. The parts that appear ‘broken’ are most likely not fully ossified yet. 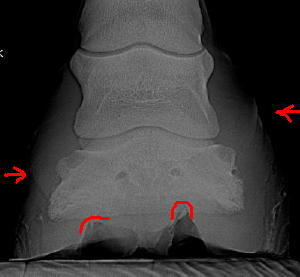 The plainly prominent and deep collateral grooves can prevent flexing of the foot which further prevents shock absorption, which can contribute to the formation of sidebone. 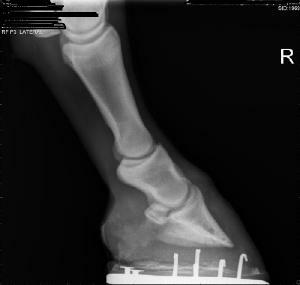 Below is an Xray of a Right Front hoof. 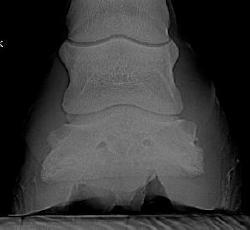 The right side is the medial side, the left is the lateral one. (The view is from the front). The two views are the same, one shown un-marked up for clarity. 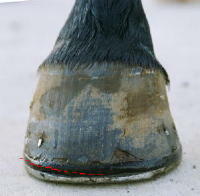 The tops of the collateral grooves are indicated with red marks. The depth of the collateral groove is determined by the height (or length) of the bar, which is not visible on xray. The collateral groove on the medial side is very deep, much more so than the lateral side. 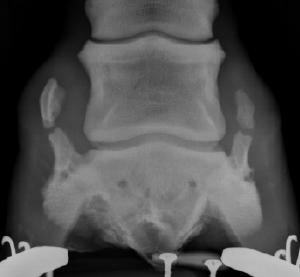 It appears to be projecting up into the bottom of the coffin bone which is probably very painful, since this area is full of sensitive tissue. The bar and collateral groove has pushed up the inside side of the foot, displacing the balance of the foot. The inside wall is much higher and longer than the outside. The hairline and top of the wall/coronary band are indicated with the red arrows. The two points should be straight across, parallel with the ground. Another detrimental effect of this deep collateral groove is the displacement of the P3/P2 joint. The joint space is narrower on the outside, wider on the inside. 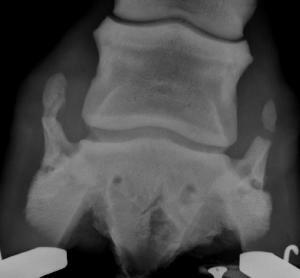 This can lead to ossifications and arthritic problems such as sidebone and ringbone. Lowering the bar on the inside to the same length as the outside will correct these balance problems. This is a 9 month old filly whose right front foot is clubby. 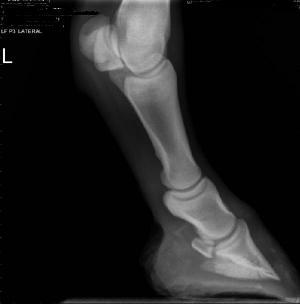 It has been shod on the recommendation of several vets and farriers who believe the tendon is ‘tight’ (despite no evidence to indicate this), and shoeing it and gradually lowering the heel is expected to correct this situation. The toe wall has begun to bulge out, possibly as a result of the shoe ‘holding’ the bottom of the foot while the rest of the foot tries to grow outward.